Hey! Nate here...One thing we've never liked about doing laundry is going to wherever the laundry room is. Whether it's in a basement or a garage, it always seems like a hike and it was usually a pretty gross/unfinished space. So when we were considering renovations on our first home, we declared the closet by the front door to be the laundry room. 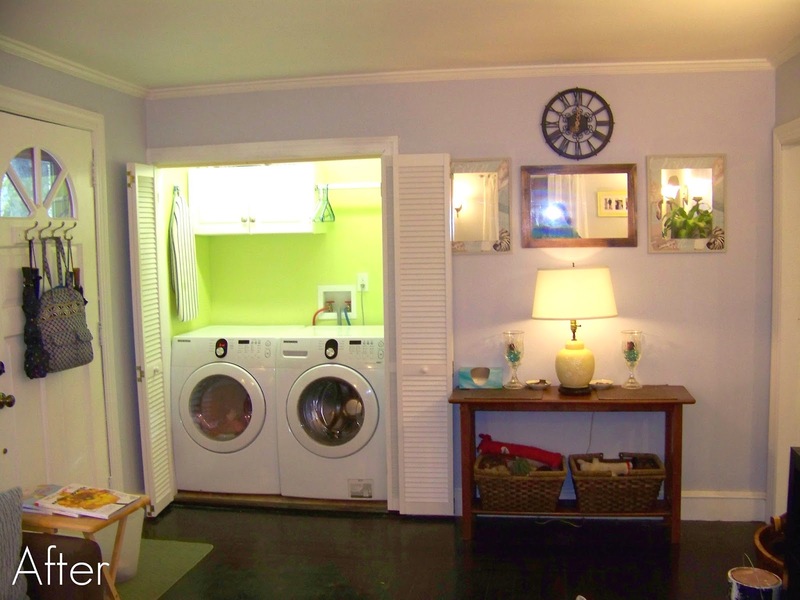 (2) We could vent the dryer easily to the outside (the wall to the left of the closet is exterior). (3) We could access the attic above because it was in the eve of the house where there was a crawlspace. Well, that's why I liked this spot. CK liked it because it was centrally located, right off the living room, and we could always just use a coat rack for the few coats we really used (We added a separate storage nook later for overflow coats but that's for a future post) . 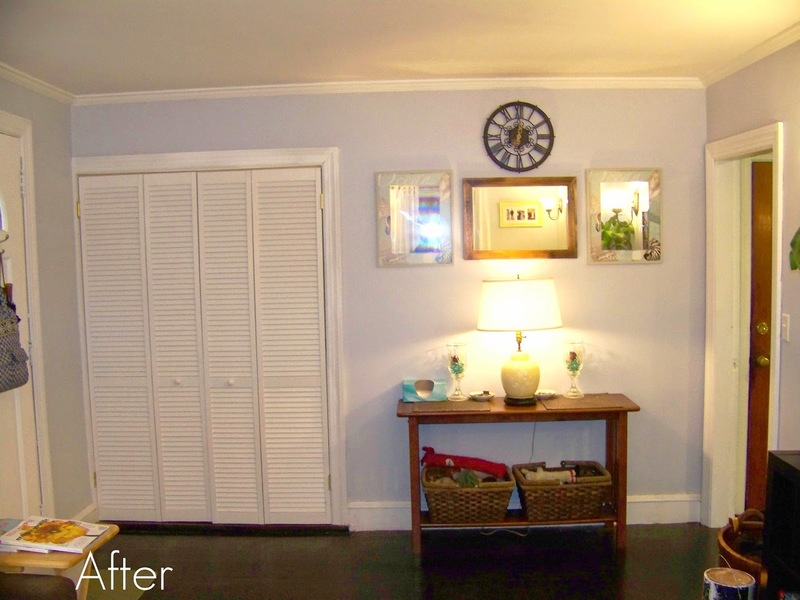 It also meant that clean laundry could be folded in the clean living room while watching TV. 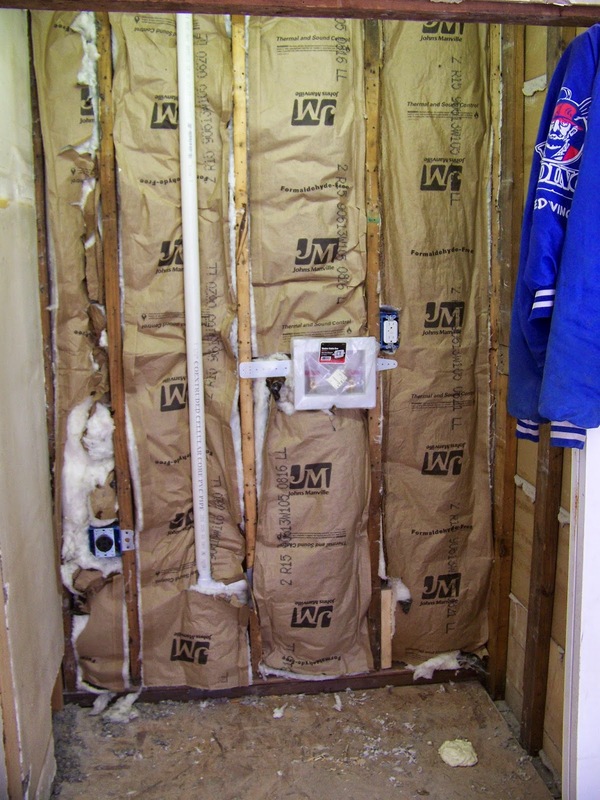 Here's the plumbing and insulation installed after we ripped down the wallboard (we saw this pic a few weeks ago ... love the continuity?). The insulation hides a lot (it's there to reduce the noise to the bedroom behind this wall) but you can see the hook ups as well as the outlet for the dryer and washer. Another important detail we thought about was the floor. 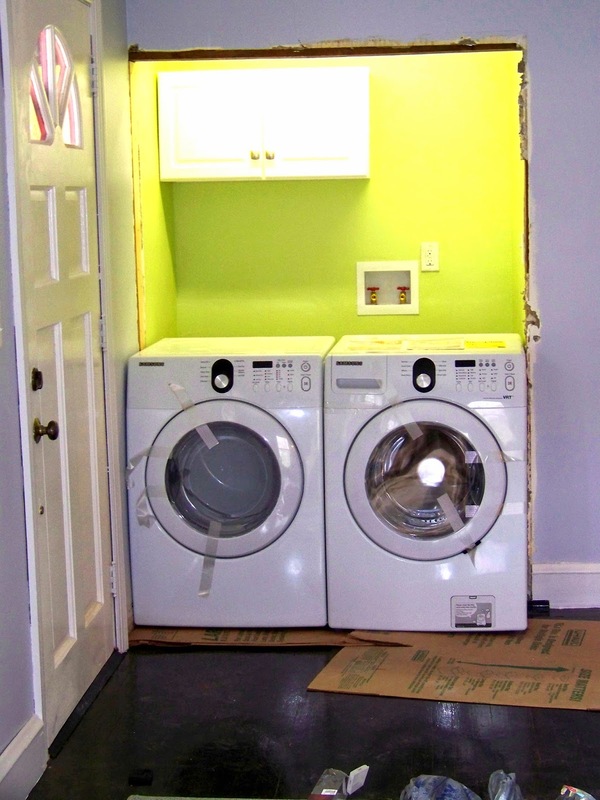 We knew the laundry units would be near living space, so vibration insulation was a must. We used DRIcore squares, which simultaneously insulated the vibration a bunch but also ensured another layer of defense against water leaks. Another thing you can't see here is increased cross-bracing for the floor stringers underneath to make sure that the floor could handle the weight of a water filled washer. 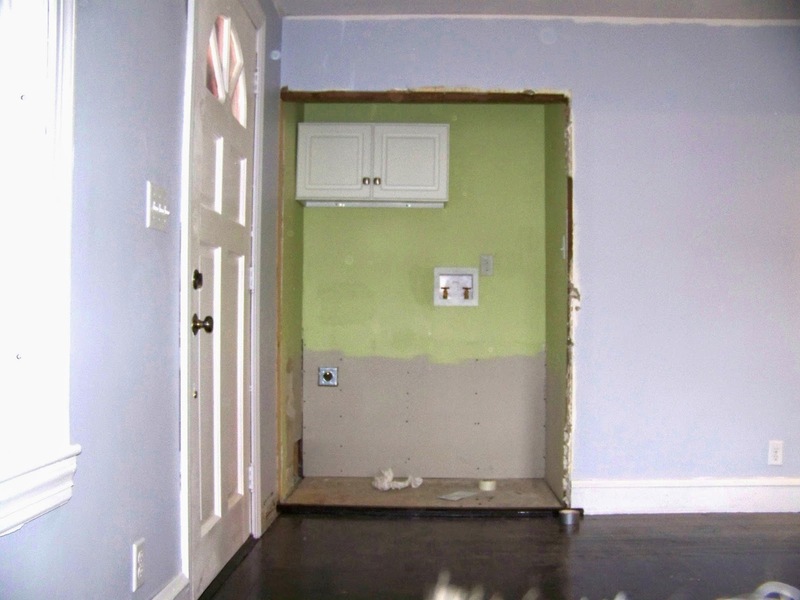 Once we had the drywall in and popped an old cabinet over the dryer side, it really started to look like a well defined space. Notice here that (1) the front door is to the left, and (2) yes, we were too lazy (or cheap?) to paint more than we had to. As soon as the washer and dryer were delivered my heart dropped. Would they fit? The answer is yes, but just barely. 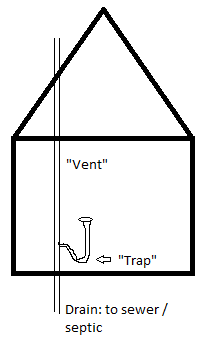 There was also limited air circulation because of the tight fit, so it was fortunate that the vent went a short 6" out the front of the house (behind a bush, no worries). With the trim and doors it was a really refreshing space. Ironing, folding, washing and drying all in the comfort of our living room. The cabinet was a must to hold laundry supplies, and we attached a short dowel for temporary hanging space. Doors closed, lights off .... who'd guess what's in there?